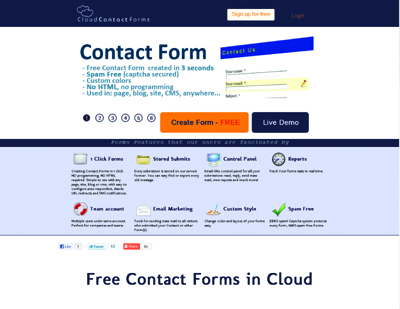 Cloud Contact Forms is best, fastest, lightest and simplest web app that gives you chance to put your contact forms (and other forms) in cloud. Hosted on our servers, stored forever in email like ajax interface, with tools that allow you to create and manage forms in one click, analyze them, export data, mass mail your subscribers and much more, everything that you need to setup web form on your site, blog or any page and keep in touch with your visitors easy and safe. Becasue Cloud Contact Forms concept is fast and light interface where users can create forms only by selecting, don’t even need to type anything.